Are you looking for the best coilovers on the market? If you are searching for how you can improve your car or replace a worn suspension, coilovers are a must-have. There are different brands, types, and styles available in the market, and some people are not sure which kit is the best route. Choosing your setup will depend on what you intend to do with your car. The most expensive kit is not always the best option. There are things that you need to keep in mind when buying the best coilovers. There are two ways to modify the suspension​; one is ​adding lowering springs, the other is ​adding a coilover system. Coilovers are coiled springs that go over a shock. The coiled springs will help you lower your car to your desired height. Some ​considerations would be longevity, price, adjustability, comfort, and performance. There are cases when people do not want to lower their car, but ​want to tighten up the suspension and provide ​added adjustability. When we talk about coilovers, we mean the coilover system that is complete with shocks. It is the most expensive and complete kit that includes everything. Depending on the vehicle or truck, these usually have pillow ball top mounts or aluminum top mounts and are ready to bolt on. This means that you don’t have to remove the old spring and shock ​in order to reuse any components. The benefit of the full-bodied coilovers is that they are complete. This type of coilover is less expensive, ​and lets you use the shocks of your choice. ​Many ​people ​prefer to use an adjustable performance shock ​together with their stock shocks. Although the shocks can last for a while before they blow out, they are not created to lower vehicles and often balance out the handling gains from the sleeve coilover. ​For those who ​drag race, there are some manufacturers that create a drag coilover. It is available in a rear set, or all four. ​The rears are ​extremely stiff to prevent the vehicle from shifting weight to the back wheels during starting, which is common on front wheel drive cars that want to keep the front wheels on the ground as much as possible to maintain traction. The Type 1 Function and Form Coilovers are the first set of coilovers distributed by the company​. They have perfected their products ​with improvements to functionality and design. These are ​full bodied coilovers which ​are much better than ​the ​lesser quality sleep-overs that most of their competitors are offering. The item is fully threaded and height adjustable to provide a more comfortable ride in any imported car. Function & Form type 1 is of high-quality, durable and cost effective for the consumers who are looking for an innovative entry-level product for their vehicles. The Yonaka Coilover is a ​fully threaded single tube shock absorber. It is designed for Honda Civic 96-00 and all have aluminum upper mounts 0-4” height adjustment. The package includes an adjusting tool. It is designed for the aggressive daily driver, and is perfect for weekend track days, giving a smooth responsive ride with improved cornering control and feel. If you check out other products, you will find this product ​is one of the best in the market. The spring rates are 12kg/180mm for the front springs and 6kg/200mm for the rear springs. It is a grassroots performance part manufacturer focusing mostly in Honda/Acura. At present, it has expanded their product line and now meets the needs of Subaru, Toyota, Lexus, Ford, GM, Mitsubishi, and Nissan. The Skunk2 541-05-4720 Pro-S II Coil-Over Spring is a really nice set of coilovers that is worth your money. They provide a comfortable ride and quality, and they perform well during ​turns and on the track. It is a quality all-around suspension option. The Skunk2 front spring rates are 8kg/mm and the rear rates are 8kg/mm. This product has adjustable ride height and an innovative mono-tube design. The quick and accurate ride-height adjustments can be done for dialing in corner balancing, and ​it also aids ​handling, overall balance, and responsiveness. ​The ​shortened-shock bodies offer the perfect balance between how ​your vehicle performs on the track and in daily driving. The Skunk2 reduces shaft strokes to maintain enough suspension travel on low vehicles for better performance. The Best Coilovers on the Market! Were you able to find the right coilovers for your car? We hope this review ​helped you decide which is the best coilover for your vehicle. There are lots of them online and the three products reviewed above are only some of the best-rated coilovers ​available. We cannot recommend one product as they ​cater to different car models. Choose the one that will fit your vehicle perfectly. 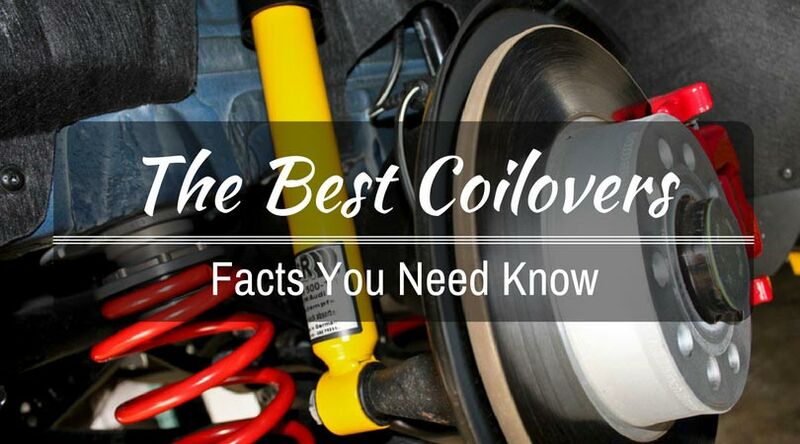 So have you decided which is the best coilover for your car? Feel free to share this with others or you can write your comments below.